Nyama Catering has over 10 years experience in the Wedding Catering Industry and in this time has developed a wedding food experience through their unique Hog Roast, Spit Roast & BBQ Buffets. We found that most young couples were tired of the same sit down silver service buffets on offer and are looking to add some fun and flavor to their special day. So, this is where we come in: Our Wedding Menu are specifically designed to add something different to your day, I mean , how often would you see a Whole Hog or Whole Lamb slowly roasting at any 'normal' wedding reception! 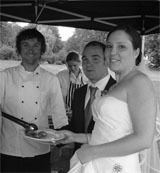 We are very aware of every brides uniqueness and therefore provide a tailor made wedding catering service. So why not have a browse of our Wedding Page or maybe even sneak a view of the Wedding Menu. If you have difficulties in finding the right venue that allows outside catering, DON'T STRESS! We've made it all simple through setting up a list of venues that welcomes Hog Roast Catering at their premises. Go and HAVE A LOOK. Being one of the most popular Hog Roast Caterers in the Country we do get booked up very quickly, so be sure to book your pig roast or lamb spit for your wedding well in advance. Our website is very informative and you'll be able to find answers to most questions on our FAQ section. Or if you are interested in how we manage Health & Safety please click here. Or maybe you want to view some pictures, well, then visit our Gallery! Our service also include Lamb Spit Roasts, Barbecue's and much more, so please click through to our Home Page at www.nyama-catering.co.uk, you won't regret the catering experience of your life!